Why is the new Annie a law-breaking juvenile delinquent? 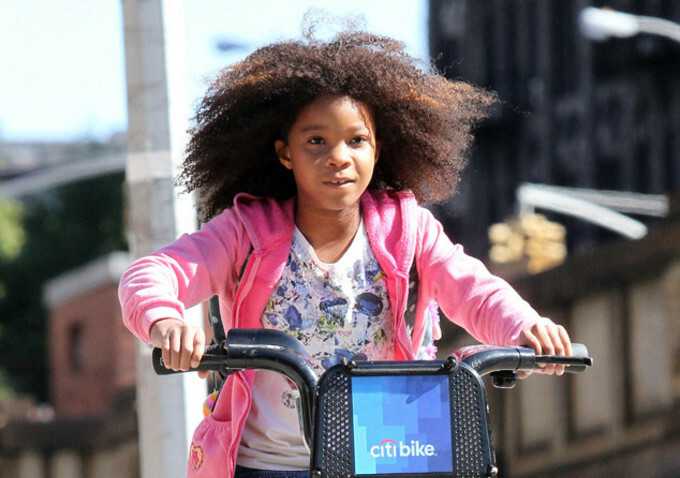 Say what you will about Will Gluck’s new updated version of the musical Annie — and people will say plenty when the review embargo is lifted — but the frizzy-haired orphan played by the adorable 11-year-old Quvenzhané Wallis is no role model for modern little girls. In the opening five minutes or so, she’s depicted breaking no fewer than three (possibly five) laws in her New York City hometown — and demonstrating some risky, life-threatening behavior that no parent would want her daughter to emulate. Then, incredibly, Annie takes off on the bicycle without a helmet. (Did the filmmakers suffer a head injury when they let this scene slide into the finished film? Imagine your daughter crying out, “Look, ma, no helmet!” before launching into the chorus of “Tomorrow.”) Understandably, helmets are a safety-conscious legal requirement for cyclists under 13 in New York City. And before she hits the picturesque streets of Manhattan, we see her pedaling on the sidewalk, another violation (even for kids) when using grown-up bikes. All’s not lost for parents whose daughters hope to imitate their big-screen idol. That wheelbarrow-dry-mopping routine with her fellow foster kids during “Hard Knock Life,” for instance, looks like good, clean (and relatively safe) fun.